In years to come, when you’ve huffed and puffed your way up the Pyg track, or joined the quaking queues on Crib Goch, you’ll be reassured to know that the highest point in England Wales will be forever… Portuguese. 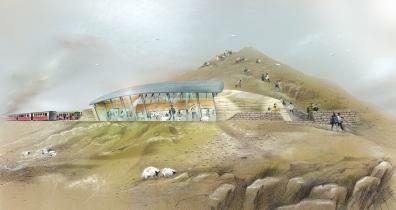 The folly that is the project to build a visitor centre on the top of Snowdon took a surreal turn with the news that its roof will be slated with stone brought all the way from Portugal. You might think, as your soles crush another mound of finest Welsh slate, that there would be enough stone around the summit to do the job with locally found stuff. Think again. With the logic that only people with no love of mountain habitats can fathom, the Snowdonia National Park Authority is importing the roof slates from the Iberian peninsula, with all the carbon cost that entails, in order to comply with European Community competition law. Maybe they should have thought of that before they dreamed up the plan to replace Sir Clough Williams-Ellis’s bizarre existing creation, described by the heir-to-the-throne, the Prince of Wales, as ‘a slum’ with an even more out-of-place visitor centre, complete with toilets, café and diagrams of how to get back down. At least the walls will be Welsh – phew what a relief – at an extra cost to us of £56,000. Building contractor Carillion has managed to find a quarry, Cwt y Bugail, near Blaenau Ffestiniog, that can supply granite to build the walls and platform pavement of the new building. Must have been difficult finding suitable stone in an area as bereft of the stuff as Snowdonia. The BBC website reports that some of the people who contributed to the appeal which raised £350,000 and local politicians said they were annoyed Portuguese granite would be used for the roof of the building. Beddgelert community council chairman Ken Owen said he was ‘bitterly disappointed’. He said: "We have as much stone as we could wish for literally underfoot, of whatever colour you could possibly want to do this work." Alan Hughes, who contributed to the public appeal, said that the decision was ‘a disgrace’. He said: "I am shocked. There is no finer stone than Snowdonia stone." National Park chief executive Aneurin Phillips announced that local granite would be used to build the walls and exterior flooring of the new building. “It has been a long, difficult and complex process. Due to the restraints of European law, it has not been possible for us to insist that materials for the new building come from local sources. “The contractor is aware of the fact that as an authority we are extremely eager to use as much local material as possible. The contractor takes over the old café on 11 September and Welsh Assembly ministers, Carwyn Jones and Sue Essex will lead the ‘demolition’ ceremony the day after, if you want to go and congratulate them.